Classifieds are $15.00 per month for the first 30 words then $.35 per word after. 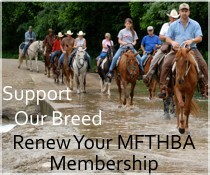 They are posted on the web site and in the MFTHBA Journal. For SALE: Gorgeous dapple grey Foxtrotter.Smart, sweet, registered 9 yr old, 14.3 h mare moves off legs and neck reins.She is fully trained but currently boarded and doesn’t get out to use her skills like she needs too.She needs a job and a home with someone who will keep her from being bored.She is a trained and experienced trail horse but beautiful enough to show or breed if that is your interest.See her ad: https://www.dreamhorse.com/ad/2108493.html Text or call Cheryl at 727-470-0275.